Kevin Hart, Michael Ealy, Regina Hall and Joy Bryant star in the remake of raunchy 1986 hit About Last Night (15), as director Steve Pink aims to reach a new audience with the rom-com. What’s It About? The film follows best friends Danny (Ealy) and Bernie (Hart) as they meet roommates Joan (Hall) and Debbie (Bryant). Bernie and Joan soon become a couple, with Debbie and Danny quickly following suit. But the two relationships take very different turns over the space of a year, allowing the film to explore the issues with modern relationships. Verdict: Demi Moore and Rob Lowe starred in the original film, which was in fact based on the play Sexual Perversity In Chicago, written by David Mamet. This remake manages to succeed with a few clever changes. The decision by producer Will Packer (Ride Along) to cast black actors in the lead roles makes the new About Last Night feel fresh and instantly opens it a new audience. The 1986 version has just about faded from memory enough to warrant this revision and screenwriter Leslye Headland (Bachelorette) does well to keep the film along similar lines, without seeming lazy in doing so. 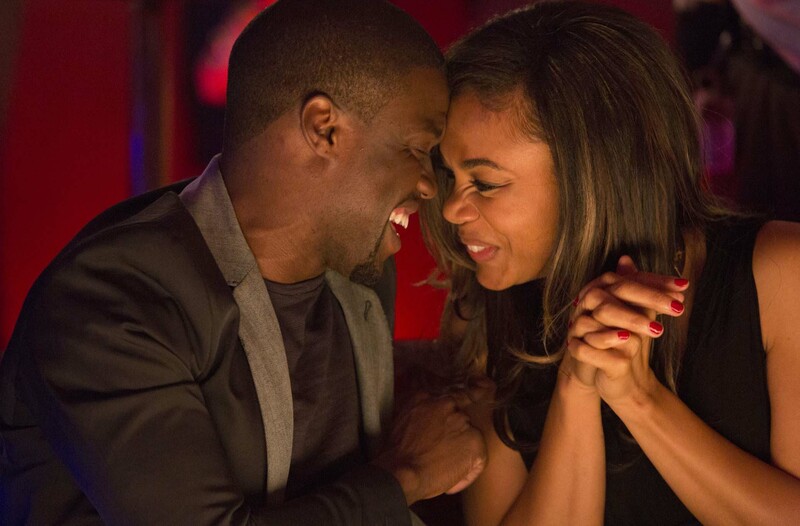 The amped-up use of brash and raunchy sexual humour is what truly makes the film enjoyable as Kevin Hart and Regina Hall compete to out-do each other as they deliver each witty line. Meanwhile, Michael Ealy and Joy Bryant struggle to outdo the original Lowe-Moore pairing, though they manage to make their characters somewhat likeable despite the predictable script. However, you never really route for them as a couple because their characters are just a bit too nice and perfect, even when they’re fighting. Hart is having an absolute blast in his career right now. Following the success of his stand-up tour, his film Think Like A Man and the more recent Ride Along, it seems he’s finally got to the point where he can draw audiences to the cinema based on the power of his name alone. And fans won’t be disappointed as he faultlessly delivers his unique brand of over-the-top comedy. And as always, he manages to own the screen while still allowing his fellow cast to shine alongside him. But the true star of the film has to be Regina Hall, who manages to match and sometimes even outshine Hart. As an actress, she’s known for her natural comedic flair, but this role sees her explore a character she hasn’t quite touched upon before and she excels at it. Hart and Hall actually end up being more memorable than the main couple and seem to go on more of a emotional journey… though, you might never be able to look at a chicken suit the same way ever again! Final Words: Kevin Hart and Regina Hall inject heavy doses of hilariously shocking comedy into another slightly stereotypical rom-com. The script leans heavily on the original, but the choice to cast black leads helps to inject new life into the story for today’s audience. Just try not to get upset about how much food seems to get wasted in this world of love and lust! About Last Night (15) is in UK cinemas from 21 March 2014.